(Action, Adventure, Comedy, Fantasy, Horror, Sci Fi, 2011) (15) D : Steven Kostanski W : Jeremy Gillespie. 1h. Canada. TAGLINE : Revenge is Back. When I saw the preview for this film it looked like a low budget version of Hardware (1990) mixed with claymation work… which would work for me.. When I started watching it became apparent I was watching the boyhood dream film made by a bunch of 7 year old kids from the 80’s high on meths… and that works for me. If you could imagine a few kids with a couple of manga toys, a robot toy melted to a GI Joe doll, a generic kung fu toy and a modified skeletor figure.. playing a game and making things up as they go along and filming it.. that is this movie! I think you can hear them making light saber and kapow noises in the sound effects!? If you love pulp films, Troma or just inventive comic stuff, if you watched Liquid Television, or listened to Gwar you’ll understand how great this film is. Big budgets and expensive effects don’t tell a story. It’s the personality and character of the cast that can carry a great film. 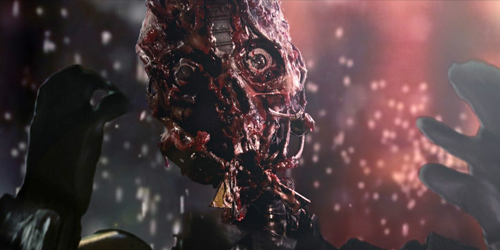 After the initial shock sets in.. You gotta love Manborg! It’s one of those movies that’s so bad it’s good. Not to be taken seriously, settle back, drink some beers, have a smoke and enjoy this with your friends, it’s only an hour long, you can watch it twice! TIL : No matter how evil a “thing” is, it can still fall in love. BS : Any scene with the Kung Fu guy who’s actually called “#1 Man” who had a strange dubbed voice which makes me giggle like a kid every time.. I need help.